I’ve always been fascinated by specific characters within Anime and Manga, as a fan of Japanese pop culture (or as wikipedia would call me a Japanophile) I spend hours searching for wallpapers, quotes, clothing and anything else Anime based that isn’t actually the Anime. I often know about an Anime through a character first, for example, I know of Vocaloid even though I have never watched it, yet I know Miku Hatsune by name and sight, and that she has become a world renowned pop start, having just done her first tour in the US (bearing in mind she is an Anime character, and not real) If you are interested to see what I mean watch this video. The difference between Japanese pop culture and Western pop culture is the relationship between consumerism and art. In the west artists like Andy Warhol and Banksy take consumerism and turn it into art. 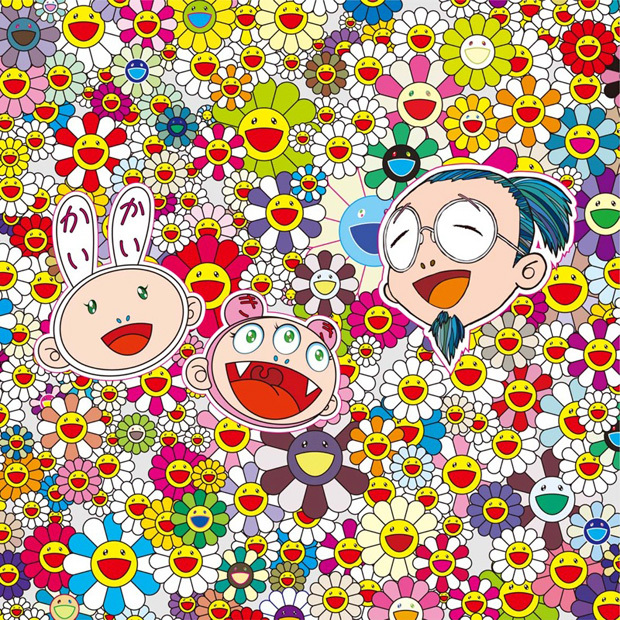 But Japanese artists like Takashi Murakami use art and turn it into consumerism. This is something which makes most Manga a form of Transmedia. A project starts out as a drawing it then becomes an anime, then a plushie, then a costume, then trading cards and so it goes on. I am yet to find a Manga that isn’t an Anime or vice versa. What would be interesting to explore is the multiple platforms used by Japanese Anime and Manga. I started a project a while ago which has been out of my mind for a couple of weeks. I wanted to create Anime characters without creating the Anime. Cutting out what people expect to be the original source and going straight to the other platforms. However I was limited to photography, as this is my skill set. If I collaborated with artists to create the characters, actors to create the voices, musicians to create the theme song this could be a really interesting project. I had a go at attempting a character a while ago, he was called bird, but I left it as it was underdeveloped and I didn’t have time to give the character life. One thing this project will help me with is not trying to do everything alone, let other people in and work with them to make the project better. In brief terms it’s creating the fan base without having the ‘typical’ origin. I could create cosplay images of people impersonating the fictional characters, and other people could use their skills to create art relevant to that, and we would all work as a collaboration. As a team we could come up with a story line which always lingers but is never written down, a brand, colours and the rest of the products.